Readers of my last post for Awfully Big Reviews, will know that I'm stepping back into poetry with both feet. (Thanks so much, by the way, for the recommendations I received on Twitter - am working my way through them at the moment!) No surprise that Overheard in a Tower Block, full of poetry from Joseph Coelho and illustrations from Kate Milner, was on the top of my birthday wish list earlier this year. There's nothing like great poetry to highlight the power of just a few words, carefully placed in just the right order to elicit a range of emotions. Deceptively simple, and oh so intriguing for being just that. Coelho's collection is centered around growing up in a city, family, relationships... and family, accompanied by Kate Milner's great black and white pencil work capturing the mood. The result is a cohesive selection, aimed at a slighter older age group than his previous collection, (Werewolf Club Rules!). Coelho takes us on a journey - living in a tower apartment block, mean kids at school, arguing parents which escalates until Dad leaves home... and then disappears. Whilst 'Tables Red, Green and Blue' highlights the petty yet hurtful actions of children, the prized red trainers flash through a number of the poems and in to the comfort of Richmond Park. As the collection reaches its conclusion the tone continues to feel more uplifting, culminating with 'There Are Things That Lurk In Your Library' (see the video clip below to enjoy Joseph Coelho reading it). Like any great poetry collection, Coelho's Overheard in a Tower Block takes the reader on multiple journeys through multiple emotions. Some are playful, whilst many others are thoughtful, powerful and demand that you pause. Stop. And think. I like that very much. There are things that lurk in the library - poem by Joseph Coelho from Joseph Coelho on Vimeo. Emma Perry is a picture book writer represented by Bell Lomax Moreton. She is the founder of the childrens book review site MyBookCorner and organiser of International Book Giving Day. This looks great. Thanks for the steer! Great post! A while back I wrote about him in an ABBA blog about children running wild and wild spaces. The video in your review was tremendous and deserves to be shared. Thank you! I have this book of poems by my bed! 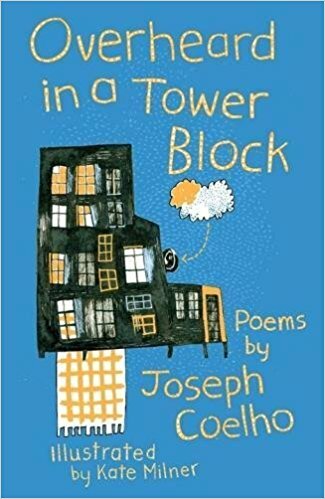 I grew up only a mile or so from Joseph Coelho and it was a treat to find poems about the places where I played as a child.